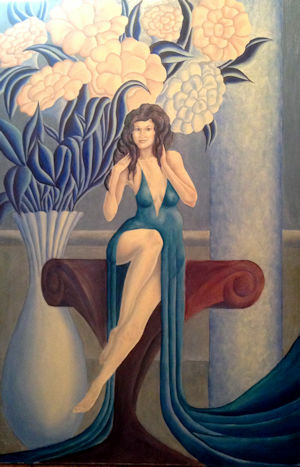 My painting called, "Classic Elegance" was completed a few weeks ago. I've been so busy with new work and teaching art classes it has taken until now to write about how it came to be. 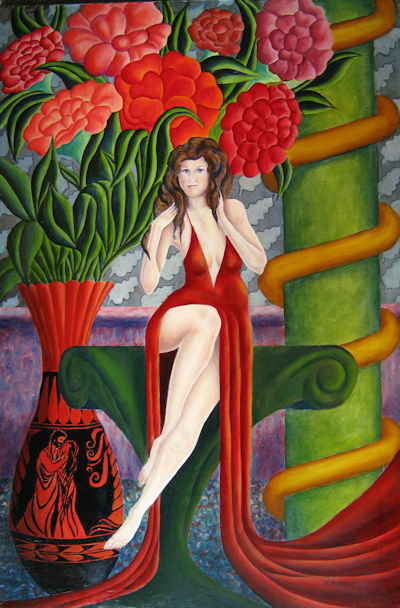 It all started about three years ago when I did a sketch of a lady I knew rather well, and loved the poem, "Ode on a Grecian Urn" by Keats. It has also always been one of my favorites. She posed in my studio for it but not in that setting, of course, nor in the gown. Actually her hair wasn't anything like that either. I guess she was the muse who gave me the initial idea. The painting is 36 x 24 inches in oils and was started from various small sketches. I drew the painting on tracing paper and then copied it to the canvas which I had toned with a pale cerulean blue wash. I than did an underpainting in white and cobalt blue. The next day I gave the chair a glaze of purple, the hair darkened with burnt sienna and cobalt blue, and the skin a thin glaze with a pink from cadmium vermillion and naples yellow. The flowers were tinted with a pale cadmium red glaze. All this was done a few years ago. I didn't know how I wanted to proceed. Besides, I wasn't seeing the lady any more. [grin] So, I put it aside, and sort of forgot about it. A few months ago I ran across the poem again. I also found myself with a new muse. That made me think of the painting so out it came. By this time I had different colors in my mind and in most of my work. I did drawings of the column and of the urn. I traced them on the painting. I then went at it with the new more vibrant color scheme. I added the background in what might be a simple sort of "Klimt-like" patterning. I added the imagery to the urn as part of the Keat's poem. The part where the two lovers can never complete their kiss but will always have that same longing and antisipation. Love will endure. Most of the painting, after the drawing was done and the new items roughed in with semi-opaque paint, was done with glazes. The figure, always the most important part for me, was done with various layers using my three standard colors for skin, cerulean blue, naples yellow and cadmium vermillion. As so often happens, the final work was much different than what I first envisioned. I admit I was happy with the result. IF you are interested you can see a larger photo of it in my gallery or if you would like a print you can purchase one from Fine Art America.